It's a turbulent winter morning over the continental divide of Colorado. The winds are howling and the snow is blowing hard off the ridgelines. Hallet Peak, one of Rocky Mountain National Park's most recognizable peaks weathers it all. 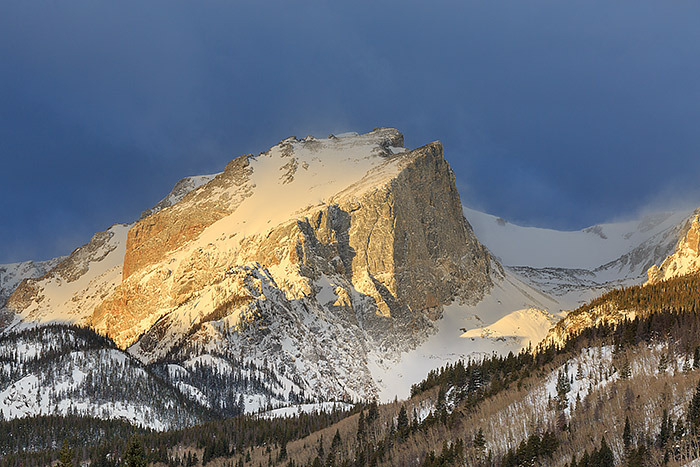 The sun shining through the clouds and illuminating the blocky granite flanks of Hallet Peak give warmth to this famous icon of Rocky. Photo © copyright by Thomas Mangan.